Disclaimer - This is our list of 120 craft beer breweries that we think should be visited or have their beer tasted, not an official guide" National Geographic's classic political map of Britain and Ireland shows country boundaries, thousands of place names, major highways and roads, airports, bodies of water, and more. National Geographic's Executive political map of Britain and Ireland is both an attractive addition to any study or classroom and an informative tool for exploring these fascinating countries. The map features thousands of place names, major highways and roads, airports, ferry routes, bodies of water, and more. Handy indexes make it easy to identify the counties, districts, council areas, unitary authorities, and metropolitan districts of Ireland, Northern Ireland, Scotland, Wales, and England. An inset provides detail of the Shetland Islands. National parks are clearly indicated in green vignettes, and shaded relief reveals the interesting and varied topography of these island nations. English and Gaelic (Irish) share official status per the Republic of Ireland's constitution, so place names are rendered in both. In the Gaeltachtl, or predominantly Irish-speaking regions, only Irish place-names have official status and are used on signposts. These districts are found within the counties of Cork, Donegal, Galway, Kerry, Mayo, Meath, and Waterford. 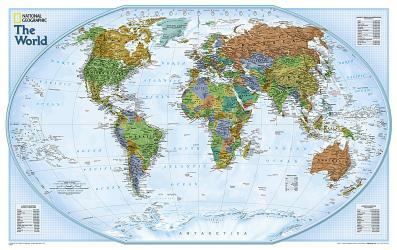 Sheet Size = 23.5" x 30.25" "National Geographic's World map is the standard by which all other reference maps are measured. The World map is meticulously researched and adheres to National Geographic's convention of making independent, apolitical decisions based on extensive research using multiple authoritative source. The map is packaged in a two inch diameter clear plastic tube. The tube has a decorative label showing a thumbnail of the map with dimensions and other pertinent information." This wall map shows road and tourist details for the country of Reunion. The map is printed in color on one side and features a legend. This map shows road details for the border between the United States and Mexico, including the Yucatan Peninsula. This map is printed in color on one side and features a legend. The Appalachian Trail Conservancy is a volunteer-based, nonprofit organization dedicated to the conservation of the Appalachian National Scenic Trail. They publish this at-a-glance map of the entire 2,175 mile Appalachian Trail which is useful for reference, trip-planning, and keeping track of hikers. 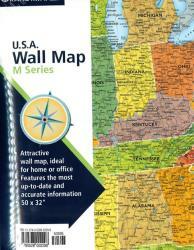 Wake up your walls with Rand McNally's colorful, contemporary U.S. Wall Map. A combination of bold colors and detailed cartography makes this map stand out in any home, classroom, or office. 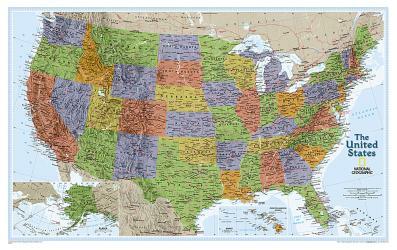 This U.S. folded wall map serves not only as a handy reference piece, but as an eye-catching accent for any room or office. Thousands of place names are carefully and artistically placed on the map to maintain legibility even in the heavily populated areas of Europe, Asia and the Middle East. Details include clearly defined international boundaries, cities, physical features, rivers, and ocean floor features. Inset charts list the largest cities by population and the largest countries by land mass and population. 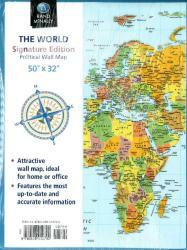 The United States Explorer map is a classic example of the cartographic excellence National Geographic is known for. This colorful political map clearly shows state boundaries, capitals, major highways, rivers, lakes, and many major cities. Insets show detail of Alaska and Hawaii. The color palette is vibrant and stunning shaded relief provides additional texture and detail. 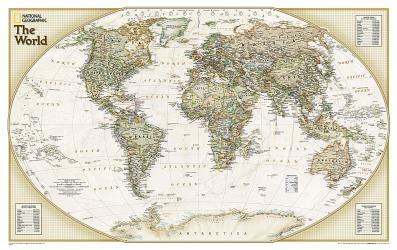 The Explorer Executive style World map uses a antique color palette, stunning shaded relief, and a subtle background grid pattern that echoes the cartographic precision that underlies all National Geographic maps. Drawn in the Winkel Tripel projection, distortions are minimized and unlike many other World maps, Greenland is show the same size as Argentina and not as the size of all of South America. Thousands of place names are carefully and artistically placed on the map to maintain legibility even in the heavily populated areas of Europe, Asia and the Middle East. Details include clearly defined international boundaries, cities, physical features, rivers, and ocean floor features. Inset charts list the largest cities by population and the largest countries by land mass and population. .
. Large, folded wall map of the Piedmont Triad, NC (Greensboro, Winston-Salem, and High Point). Extensive index on reverse. Updated and redesigned, Rand McNally's Signature World wall map features eye-catching bold and vivid colors that make this the perfect reference piece sure to stand out in any home, classroom or office. The precise detail and digital accuracy shows color-matching relief and other physical features without sacrificing the maps readability. 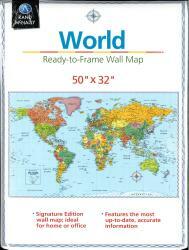 Product dimension: 50" x 32" Updated and redesigned, Rand McNally's Signature World wall map features eye-catching bold and vivid colors that make this the perfect reference piece sure to stand out in any home, classroom or office. The precise detail and digital accuracy shows color-matching relief and other physical features without sacrificing the map's readability. 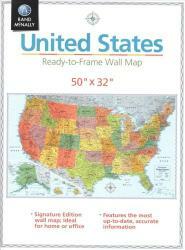 Product dimension: 50" x 32"
Updated and redesigned, Rand McNally's Signature United State wall map features eye-catching bold and vivid colors that make this the perfect reference piece sure to stand out in any home, classroom or office. The precise detail and digital accuracy shows color-matching relief and other physical features without sacrificing the maps readability. Product dimension: 50" x 32" .
. 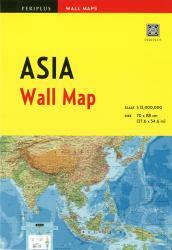 This edition of the Asia Wall Map is scaled at 1:13,000,000 and features an easy-to-use legend for quick reference. When not in use, the map can be folded to a compact 7 1/2 x 10 3/4 inches and stored in a protective pocket with a cardstock cover. However, when opened, it hangs for easy display.